Successfully Added 1080P Wireless IP Camera - IP66 Rating, 8GB Onboard Storage, 25M Night Vision, 20MP 1/2.9 Inch SONY CMOS to your Shopping Cart. This 20MP full HD security camera with remote viewing support lets you monitor your home or office from your smartphone, tablet PC or computer. A wide angle camera lens and 4 programmable detection zone with adjustable sensitive ensure you're notified of any disturbance within the cameras field of view. Great for protecting entrances and exits to your home or back office space. With the ability to snap and store pictures onto a built-in 8GB of storage you'll have a record of the comings and goings of all visitors. The 1/2.9 inch SONY CMOS provides detailed viewing and recording while 12pcs SMD array infrared LEDs ensure the camera can work in low light even when capturing images up to 25 meters away. A water-resistant IP66 rating keeps the camera safe from the weather making it suitable for use outdoors or in. ONVIF 2.4 compatibility guarantees this camera has the highest level of support allowing it to work with the rest of your ONVIF security and surveillance equipment. 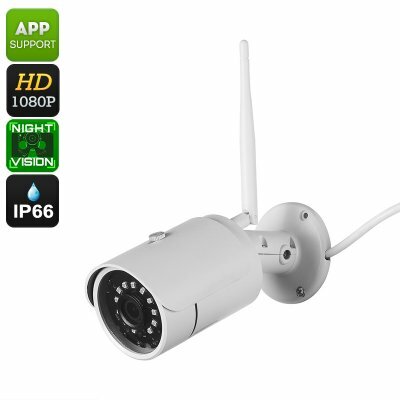 This HD security camera gadget comes with 12 months warranty, brought to you by the leader in electronic devices as well as wholesale WiFi IP cameras and security systems..